Ready to get crazy? 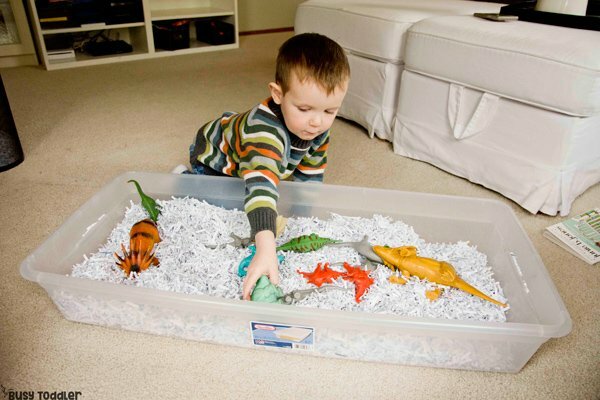 Try this dinosaur sensory bin. 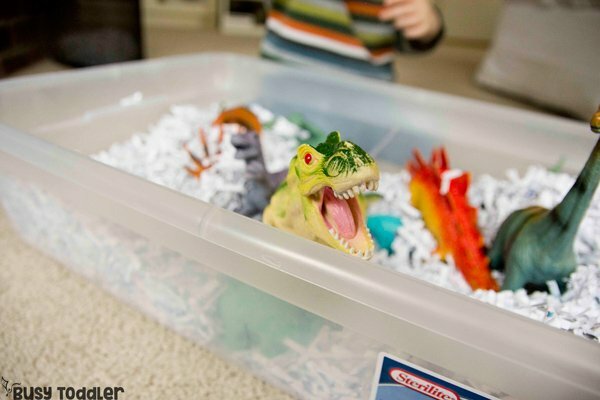 Back when my oldest was 2, I made him a construction site sensory bin using shredded paper. It apparently stuck with him and the other day, he came downstairs asking to make his now two-year-old brother a similar bin. 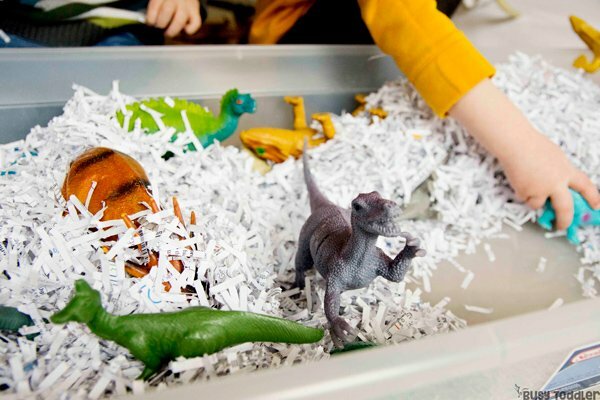 But this time – we went with a dinosaur sensory bin. 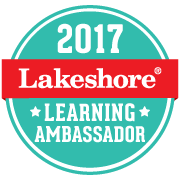 Activities don’t have to be complicated to be awesome – and this is a prime example. A bucket of shredded paper made my kids’ day. RELATED: Wondering how I teach my kids each day? 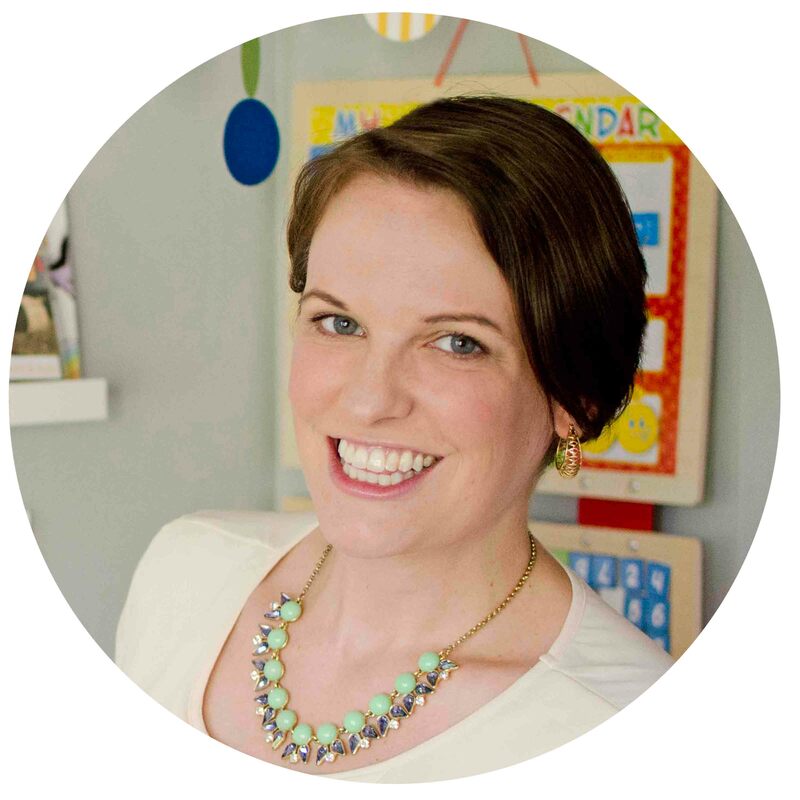 Check out Playing Preschool – my at-home learning program. What is this bin anyways? The base of this bin is shredded paper – so it’s basically a sensory bin of old bills and junk mail. Years ago I made a bin for my oldest in our living room: a plastic swimming pool filled with shredded paper and construction trucks. It stands to this day as one of our favorite morning memories ever. He played for hours. And I mean hours. He’s 5.5 now and remembers that bin well, so I shouldn’t have been surprised when he had the idea to recreate this bin his brother. 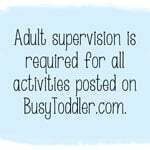 RELATED: Thinking of setting up a sensory bin? Check out my tips and tricks. We took our shredded paper and dumped it into a large under the bed storage container. Next we added a bunch of dinosaurs. Wait. Why did we add dinosaurs? 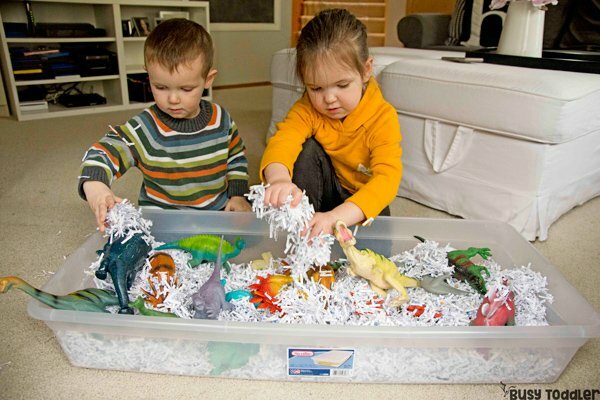 We added dinosaurs because that’s what we have and that’s what my youngest two (4 and 28 months old) love to play with. The best advice I can give about activities: make them something your kids will like. Maybe they like horses, or dolls, or construction trucks. 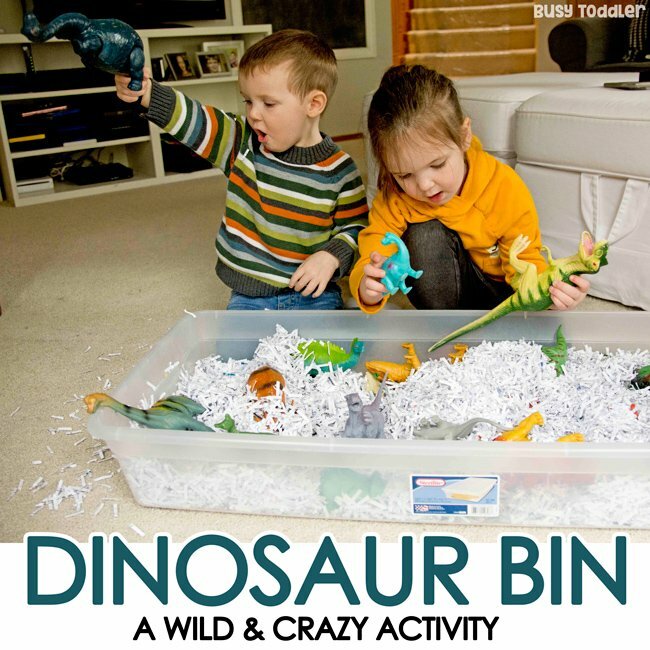 The point is – theme the bin how your child would want it. 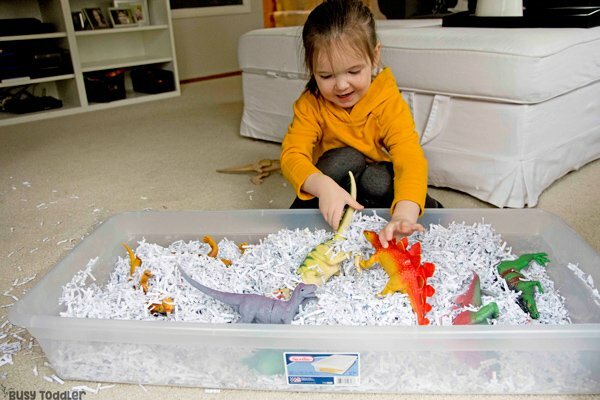 What did they do with the dinosaur sensory bin? They imagined. They created. They played together. Remember, just because you can’t immediately see the learning or just because they aren’t doing a worksheet, that doesn’t mean the activity isn’t amazingly good for them. 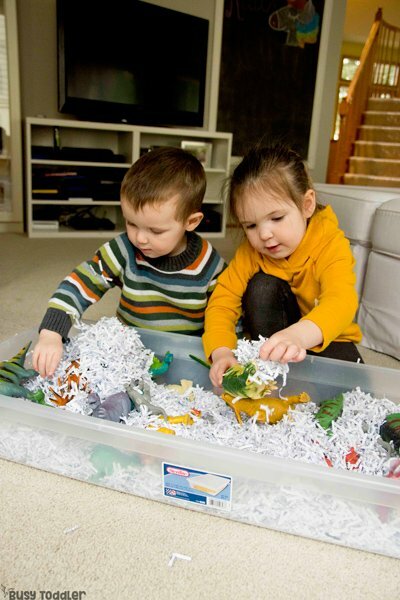 Sensory bins give kids a chance to explore and experiment in a safe and meaningful way. 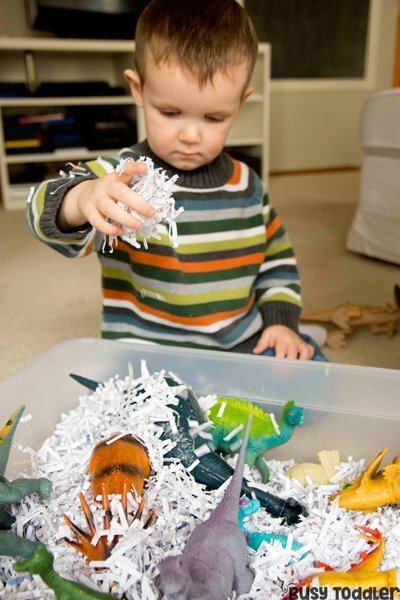 RELATED: Want to know the benefits of sensory play? Check out this post. How big a mess did this make? Um…can I plead the 5th on that? This is admittedly THE messiest bin that I let my kids do. Anytime that we are playing with shredded paper things get crazy. ON THE FLIP SIDE… this is one of the easiest bins to clean up. We worked as a team to pick up as much of the paper as we could by hand. Then it was vacuumed up. In about 6 minutes, we cleaned up a mess that took my kids more than an hour to make. Some of the mess on my carpet – oh well! Wait…how long did they play for? You read that right: ONE HOUR. That’s the magic of a good, unexpected sensory bin. It hooks kids in and leads to all kinds of play. It pulled my kids in, hooked them immediately, and made for one fantastic morning of memories. 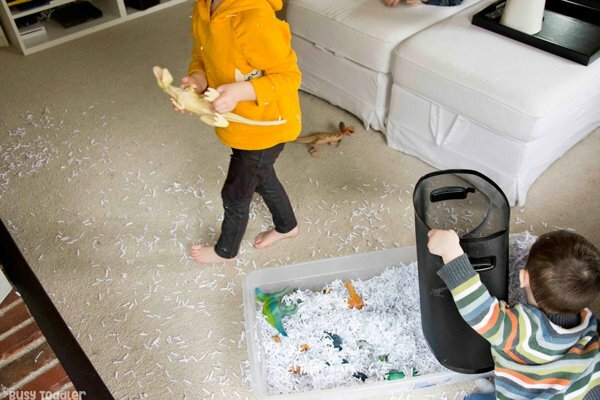 What a full circle moment for my oldest to make an activity for my youngest… and of course it would be the shredded paper bin for the win (again!). 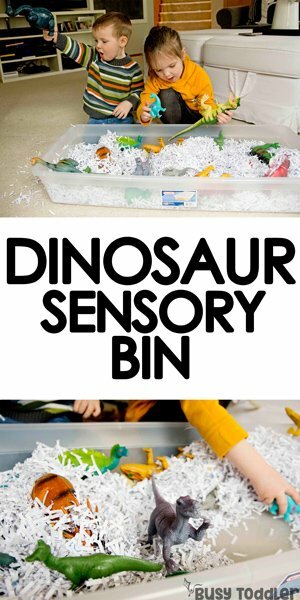 When will you make a dinosaur sensory bin?